The long, slow goodbye to Major League Baseball 2K has been widely expected for more than a year. 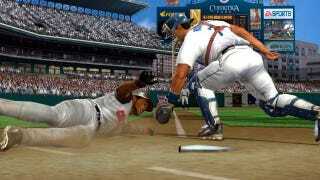 Gamers therefore assumed that EA Sports—frankly the only publisher with shoulders broad enough to take on this kind of a job right now—would jump back in with MVP Baseball (pictured). You can forget about that happening anytime soon. At E3, I spoke with Andrew Wilson, the executive vice president in charge of all of EA Sports, and put him on the spot. Will EA Sports get back into baseball on this console generation, or will it wait for the next round of hardware? "So we just signed an amazing deal with the UFC," he said, smiling. "Amazing. It is going global. it is going cross-platform, and it is going to take a lot of our focus when we think about getting new things started anytime soon." He's referring to the surprise announcement on Monday—for my money, it is the shock announcement of E3, though it won't get credit for it—that EA Sports had acquired the license to make Ultimate Fighting Championship mixed-martial arts video games. In addition to taking a lot of EA Sports' attention in the years to come (length of the deal was not disclosed) and a lot of cash (nor were terms), it's a faster-growing sport for which EA Sports already has working assets on the current generation of hardware, thanks to 2010's EA Sports MMA. So that means no MVP. And that effectively means there will be no current simulation baseball title on the Xbox 360 when March rolls around next year. Take-Two Interactive's license with Major League baseball is set to expire this year. The only thing more unlikely than Take-Two wanting to renew is Major League Baseball doing it at terms acceptable to the publisher, which is getting the hell out of licensed video games. Its only one left will be NBA 2K and that's because it is critically acclaimed, a year-round sales leader, and singlehandedly made 2K Sports profitable despite a $30 million annual loss generated by MLB 2K. Sorry Xbox 360 baseball fans. You've had your denial. You've had your anger. Doesn't look like there'll be any bargaining. Time to move on to depression and then acceptance.